Quilting Adventures: Small but meaningful...! I would like to share with you my last project for Jo's Little Women' Club. It is a small quilt that became therapeutic for me. You could almost say, it was a method for mourning a dear friend. You see, I started this project the day my friend Cheryl left the bonds of earth. Yes, on that very day! So in her honour, I have named it Stone Patches. It's a cute little project! Scrappy! I even used a couple of hour glass squares from a previous project! Yea, scrappy! I must admit, I am enjoying working on these small quilts. They make gorgeous accent pieces in a room. I have picked a winner from the post Things that make you go Hawwwww! Thank you to all those who posted. I enjoyed reading your entries. The Winner is......... drum roll please...........! Kimberly of numerous blogs! So I did a inimimimanimo and picked her blog My brown bag Studio to link too! ;o) Kimberly, please e-mail me with your mailing address so that I can get the hand made notion holder out to you. Hahahaha -- I kept looking at "inimimimanimo" trying to figure out what the heck it was! NOW I get it LOL! Love your sweet little quilt! 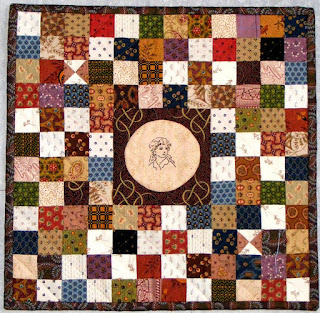 Lovely Little Jo quilt. It is a nice rememberance quilt and love the name you gave it. I do believe that 'sewing mends the soul'. What a beautiful piece. I have been stitching vintage illustrations and making them into mini quilts. They are fun and quick. What a wonderful way to remember your friend by, Carole. How special. One can never have too many mini quilts. The one you made for me in a swap two Christmases ago always takes center stage in my studio. It's my absolute fav! So sweet. Little quilts are fun to make and display around the house. 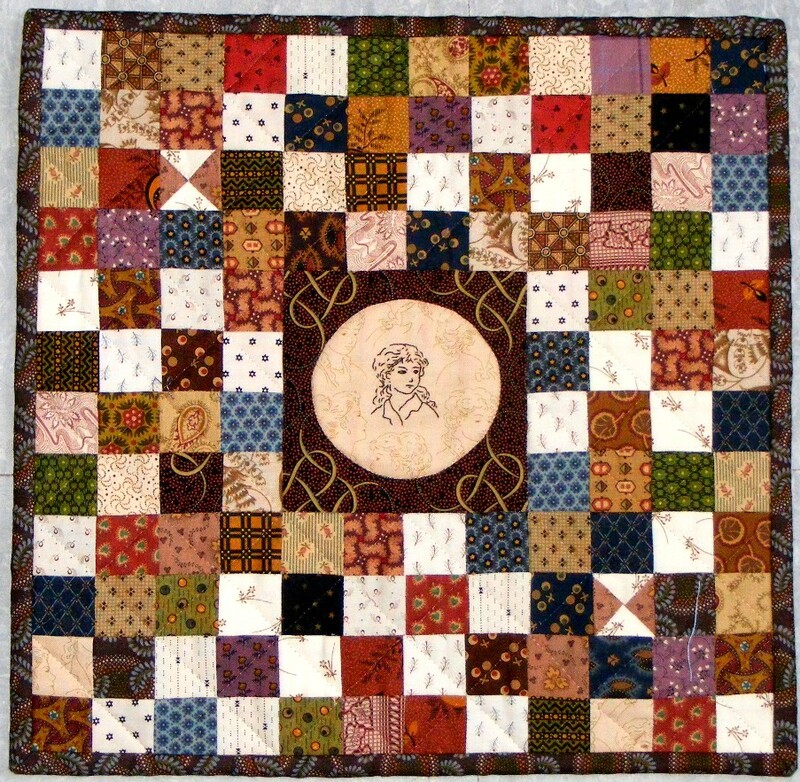 What a beautiful quilt with such special heartfelt stitches. Love it. What a lovely way to remember a friend. Carole- It's absolutely gorgeous and what a nice tribute and gracious way of honoring your friendship with Cheryl. It's seems unlikely that it will be a month since she's passed. She would smile at your finish. PS: love the hour glass blocks used too. Perfect! Love your mini quilt. Congrats on your store anniversary!!! You found the perfect fabric to embrace the stitchery of Cheryl.